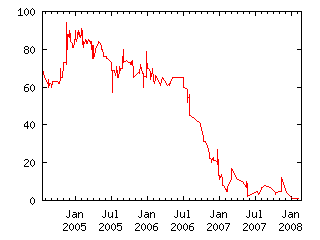 The Dollar/Yen exchange rate will drop below 100 Yen per Dollar any day on or before February 1, 2008. The source will be the Federal Reserve's Daily Foreign Exchange Rates FRB H.10 release available at http://www.federalreserve.gov/releases/h10/update/ . In 1995 the Dollar/Yen set a record low in the low 80's. The Federal Reserve reports an exchange rate of 108.60 as of July 2, 2004. Foreign Exchange is a 24 hour market, so the concept of "close" is not very meaningful. For the purposes of this claim the daily number released by the Federal Reserve will be the relevant one, even if the Yen is determined through some other source to have traded below 100 at some point during the day. As of July 2, 2004, the Fed's daily quote is for noon New York time, but the Federal Reserve may change that in the future. If so the judge will use whatever rate the Federal Reserve releases. If the Federal Reserve no longer releases foreign exchange buying rates, then the judge will determine a suitable replacement and post it in the judge's statement.